Sweets - Grab Your Shades, These Neons are BRIGHT! 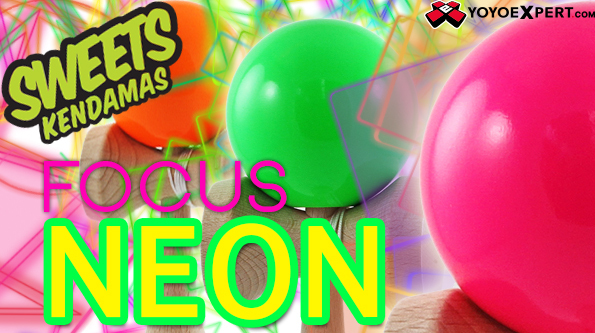 YoYoExpert is excited to present the new Focus Neon Kendama from SWEETS. Started in 2010 with the mission of spreading the benefits and gratification of Kendama, Sweet's produces Kendamas for all skill levels and are proud to paint all of them here in the USA. The Neon Focus Kendama is painted by Sweets in-house and features a cool new neon paint. This paint is so bright you'll have to wear sunglasses to play with it! These bright and vibrant tamas paired with the new Focus Ken are sure to please both visually and for play. Finished with Sweets signature high-gloss Pro Clear Coat. This kendama comes pre-strung on the new Sweets Focus Ken, and includes an extra string, bead, and an instructional booklet.